I have an irrational fear of heights, especially high trees. What’s there to be scared of you ask? It’s not like falling hundreds of feet to a gory disfiguring death would hurt or anything. It’s not like there are pirates in these high trees. But being as exceptionally brave as I am, I decided to fight my fears. 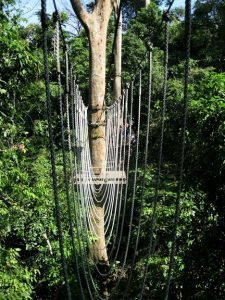 And what better way to do this than by catapulting myself on a precariously thin metal wire suspended in a rainforest canopy hundreds of feet in the air. 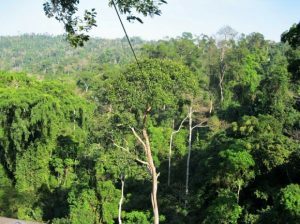 So that’s how I found myself one sunny afternoon, standing atop a freakishly tall tree, nervously tightening and retightening every single strap of a harness that’s already so tightly wound around my body that I was beginning to lose feeling in my legs. Now I wasn’t in line for my first of the nine zips I would take that day, I had already done two or three not that it gets any less terrifying with experience, but it was about to be perhaps my last. The harnesses have two hooks (if you’ve ever rock climbed you’ll know these as carabiners) that dangle with a lazy air of overconfidence. One is the ‘main’, and the other the so called ‘safety’. Now both hooks should theoretically be able to support your weight individually, but of course the engineers trust their own work enough to insist that you latch both on, you know just in case a tiny inconsequential zero was missed here or there. 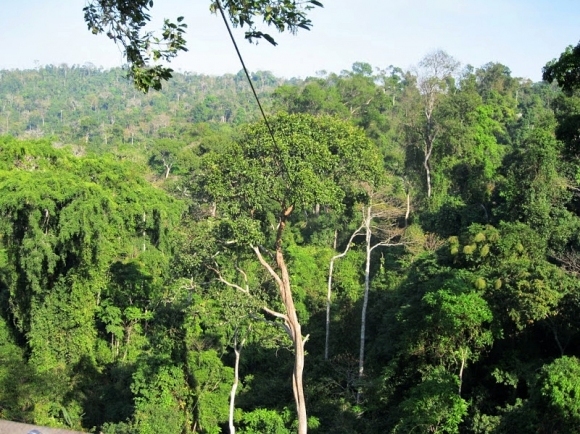 So there I was, hundreds of feet above the hard spiky unforgiving jungle floor. For miles in every direction the World was a brilliant emerald green, which I’m sure would have been stunningly beautiful if not for the too-tight strap inching uncomfortably up my rear. Queued up in single file on a rickety wooden platform, visions of hooks, eye-patches and wooden limbs flashed across my mind, the World a single colour change away from the high seas. Screams of terror erupted each time the guides ejected another one of us from the plank with a shove and a diabolical laugh. Looking across the gaping chasm between the massive tree I was on and the one that I would shortly launch towards on a single metal wire, hundreds of feet long yet barely a centimeter thick – I envisioned a particularly painful death, skewered like chicken yakiniku on a tree branch. With each step I took towards the edge, waves of terror, regret and panic took turns washing over me. It felt like an eternity had passed before I found myself next in line behind a 300 pound neckless Russian Olympic weightlifter, bouncer or James Bond brawler (let’s call him Igor). 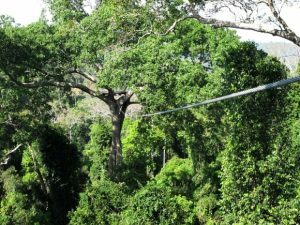 I ziplined with the Flight of the Gibbon Adventure in Chon Buri, Thailand. It was an unforgettably fun experience even without or in spite of the extra credit. All the gear was top notch and no pictures can do justice to how shockingly beautiful and unimaginably tall the trees were. I made the guides out to be rough and tumble pirates of the high trees but they were actually very professional, fun-loving and safety was their topmost priority. Awesome! I have repelled but never zip lined. What a hoot! Zip lining was plenty of fun, even if you are scared of heights! The question begging to be asked. Do you still have a fear of heights? If it is any consolation a fall from that height you would be dead before hitting the ground.The lower intestines of our bodies telescope thru the diaphragm resulting in immediate death.You are a brave person indeed! Thanks for the comment though, and yes I’m still afraid of heights, maybe even more now that I’ve read your comment.